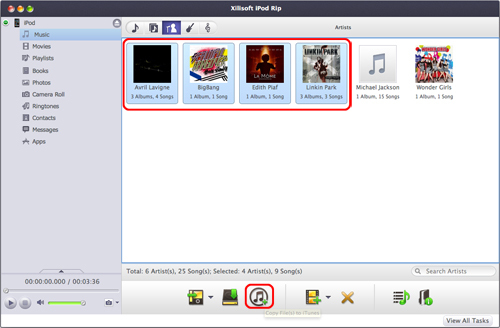 Xilisoft iPod Rip for Mac is perfect iPod copy, iPod Ripping software specially designed for Mac users. It can convert and copy music, videos, photos, ringtones, and applications from iPod to Mac and Mac to iPod. Firstly, download Xilisoft iPod Rip for Mac and then install and run it. 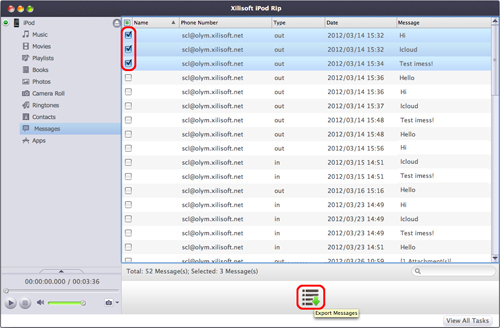 Connect your iPod to Mac, this software can recognize the device automatically and show its information on the main interface including name, type, capacity, version, serial number and format. This program helps you copy movies, music, books, photos, ringtones and applications from local folder to iPod without overwriting original iPod files. In the left directory tree, select the target device file list that you want to import files into. And then click "Add File(s) to Device" drop-down button, choose "Add File(s) to Device..." option, select the files you want to add in the dialog box that appears, and load them to your device. (1) If you want to add a folder containing all files you want, please click "Add File(s) to Device" drop-down button, choose "Add Folder to Device…" option, and then load the folder you want to your device. (2) The program allows you to transfer files by drag and drop. You can directly drag and drop files from local into the program to import them. The program helps you transfer iPod music, movies, books, photos, ringtones and applications to computer for backup. 2. Check the wanted files in the right file list, click "Copy File(s) to Computer" button at the bottom of the file list, and locate the target folder in the dialog box that appears, then start copying. 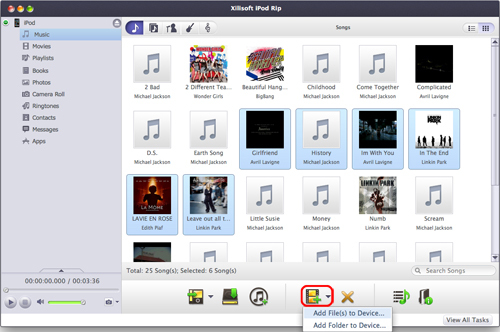 This program allows you to transfer iPod music, movies, books, photos, ringtones and applications to iTunes for backup. 1. In the left directory tree, choose the source music, movies, books, photos, ringtones or applications list from which you want to transfer files to iTunes. All files in the selected list will be shown in the right file list immediately. This program helps you to export contacts from device to local computer. 1. In the left directory tree, choose the "Contacts" which you want to export contacts to local. 2. Check the wanted contacts in the right list, then click "Export Contacts to Computer" button, choose "Export to .csv File for Google Contacts", "Export to .vCard File(s)(.vcf) for Outlook" and Windows Contacts" or "Export to vCard Single File for Other Address Books" option, and locate the target folder in the dialog box that appears, then start exporting. This program allows you to import contacts to device. 1. In the left directory tree, choose the target "Contacts" that you want to import contacts into. 2. Click "Import Contacts to Device" button at the bottom of the interface, choose "Import Contacts from .csv File" or "Import Contacts from .vCard File(s)" option, and choose the source contacts file in the dialog box that appears, then start importing. 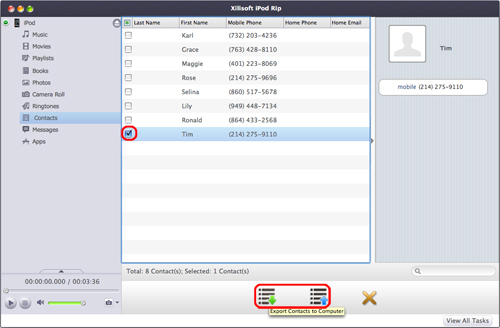 It offers best solution for users to transfer iMessages form iPod touch to computer to back up your important messages. 1. In the left directory tree, choose the "Messages" node which you want to export messages to local. 2. Check one or more messages, and click "Export Messages" button, you can choose "Selected Messages" or "All Messages" for exporting to computer in the dialog box. Furthermore, you can choose "Html File" or "Text File" as type of export file. Click "OK" button to start exporting. You can modify ID3 tag info of one file in iPad/iPod/iPhone, and also modify ID3 tags of multiple files at the same time. 1. Locate the audio you want to edit in the right file list, and choose "Modify Info..."from the right click menu to open the " Modify Info " window. 2. Edit any information like name, Artist, Album, Comments, Years, Genre, etc in the ID3 tags. Click "OK" to finish the editing. 1. Locate the audios you want to edit in the right file list, and choose "Modify Info..." from the right click menu to open the "Modify Info" window. 2. If the selected files have the same value in any field, then the program will show the value in the field, you can also click the field text box to change the field for multiple files simultaneously. If the files have different values in the Name, Artist, Album Artist, Album, Genre, Rating and Year fields, the program will show all the values in the field divided by semicolon, you can click the field text box to change the field for multiple files simultaneously.